I traveled about 151.4 miles today. Big day today, got all the way to Carl Washburn state park. Met Spencer about ten miles from camp, so he followed me there. Met Adrianne (from Belgium!) and Alex at camp. 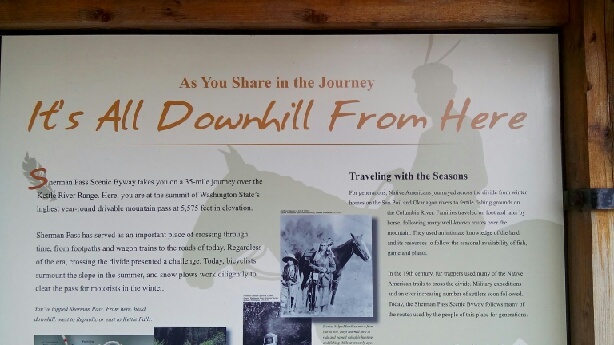 Saw some really cool stuff today, stopped at devils punch bowl and a few other cool places. Really happy with how today went. Hopefully I will continue to have good winds. Reached Lincoln city early afternoon. Favourable winds mean I will be pushing on to put on some more miles today. I traveled about 4.9 miles today. Arrived in Portland without incident (well, I had a troublesome flat when I got my bike of the train, but that's old hay by now), and met up with my friend Torie. Played some pinball and got a doughnut before heading back to her and Jared's place. Stopped by a great brewery called Vertigo and got some tasty beer and a really cool sticker. Took a rest day today before heading down the coast. Visited the rose gardens - very neat place. We all got together with Amy, a mutual friend and former classmate, for dinner, and we made a bunch of pizza. Yum. Tomorrow I begin the final leg of my journey to San Francisco. I should take me about a week. 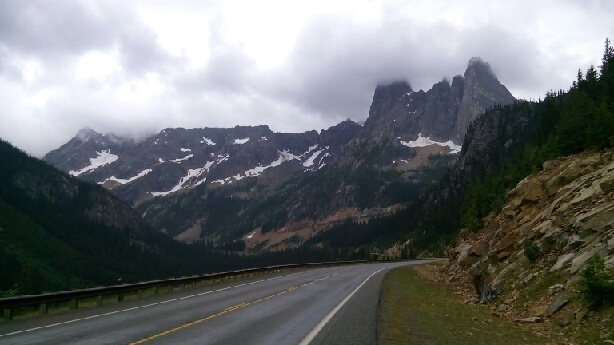 I'm really looking forward to this part, there are lots of hiker biker campsites along the way, I have a church to stay at about halfway, the scenery should be great, and I have a lot of friends in San Francisco who I haven't seen in a while. Had a late night socializing with friends, and an early morning start to catch my train, by I made it just fine. Eric, the ever wise, checked our tires last night and noticed that I had a flat. Good thing we fixed it up last night instead if scrambling this morning. Neither one of us are sure what caused it, it's pretty mysterious. I suspect that the tube may have gotten pinched back on itself, but it's a very weak suspicion. Eric rode with me to the bus stop to send me off. Caught the bus into Seattle (and got to see then space needle! ), and got on my train with plenty of time to spare. I've got to say, train travel it's also pretty nice. The route this train is taking is quite scenic, much more enjoyable than a bus. Exited to get to Portland. Not sure if I'll take a rest day tomorrow, I'll have to see how I'm feeling tonight. I traveled about 80.5 miles today. Hit the road early this morning with Eric on our trip back to Seattle from deception pass park. Really nice ride along Whidbey island, took a ferry back to the mainland and headed back to Eric's house in Redmond. Stopped a few times for blackberries, I can't seem to get enough of those suckers. Bought a big bunch back to the house for dinner. Eric, Ert, and Travis had s bunch of friends over for dinner tonight, so I got to see a number of people that I hadn't seen in a while. Hanging out with old friends and catching up gave a strange sense of normalcy, even though I'm heading out tomorrow morning. Checked the weather on the Oregon coast, looks like the next few days will have wind it if the north, which bodes well for me if the weather holds. Entering the home stretch soon, it's going to be interesting readjusting once I'm done. I traveled about 56.8 miles today. ad a great day biking through the San Juan islands. Rode up and down mount constitution first thing in the morning (unloaded, thank goodness) before packing up camp and biking back to the ferry port on orcas island. The climb up mountain was extremely steep, but the view from the top was incredible. We could even see Mt Rainer faintly in the distance. 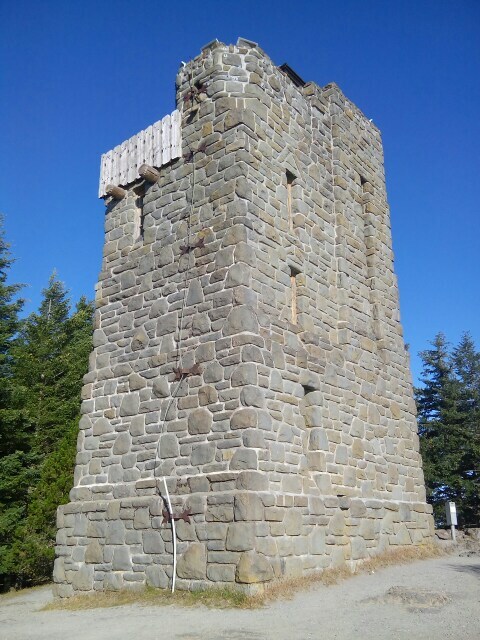 This picture is of the lookout tower at the top of the mountain, built by the civilian conservation corps during the great depression. Took the ferry to Friday Harbor on San Juan island. Biked across they island to lime kiln point, which had some amazing views of distant mountains and nearby island. Biked back along the south of the island, got a great view of mount Baker going over one of the hills. Took a ferry back to the mainland and biked another ten miles to deception pass to camp for the night. Really beautiful day, very glad I went out to see the islands. Lots of steep hills, but it was totally worth it. It's been great biking with Eric. He basically planned out places to go and camp for this weekend, and it's incredibly nice to not have to worry about that, if only for a few days. Heading back to Seattle tomorrow, then I have a train to catch on Tuesday morning. This is really becoming a multi-modal trip. I've traveled by plane, subway, car, bike, ferry, foot, and I'll be adding train and probably bus soon. Any suggestions of sights to see on Seattle/Portland would be most welcome, as I'm planning to have at least a little time to explore these cities. Exited to be so close (relatively) to my end goal. I'm hoping that arriving in San Francisco will motivate me to do some big days in the coming week. Also, I think I broke 4000 miles for this trip today. Hooray! Still have plenty more to go. I traveled about 82.9 miles today. All in all, a good day today. Despite a flat tire from a slow leak overnight, got to the bike shop just a little after they opened. Had then look at my bearing. The non-drive side cone was super pitted, and a bearing ball was missing. Not sure how that happened, but I assume it was when the spoke was being replaced. The bearings shouldn't have been open for that, though... another bicycle mystery. Cody at the bike shop was super great. In addition to figuring out my bearing problem and replacing the shot bearing, he adjusted the spoke tension in my rear wheel and cleaned the rear sprocket set. Only charged me $25. I was thrilled. Met up with my friend Eric in Burlington. We rode to Anacortes and caught a ferry to Orcas island. Rode around the island to the state park to camp for the night. We'll bike mount constitution tomorrow morning, then head to Friday harbor for a while before returning to the mainland. I bought a train ticket for Seattle to Portland for Tuesday morning. I also bought a red eye plane ticket for August 6 back to MN from San Francisco. It's weird having a date to work towards now. Should still give me a few days in sf. Lots of ripe blackberries along the road and trails today. Eric and I stopped to pick some for an afternoon snack. Yum! Feeling good today, it's nice to see a familiar face. Also great to smell the ocean. Looking forward to next few days, and next two weeks. I traveled about 77.9 miles today. 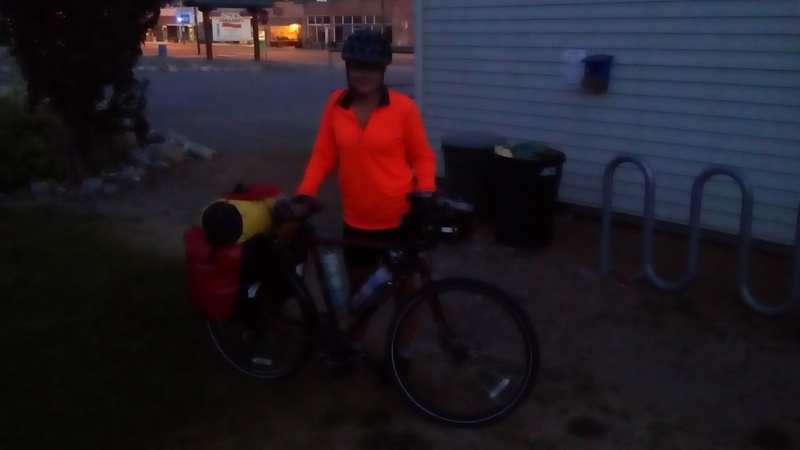 This (blurry) picture is of Jo, the cyclist that I met in tonasket. Really fun person to meet, and an incredibly early riser. She was on the road at quarter to five, a full hour before I left. Color me impressed. I also met Bruce last night, a glass artist who lives near tonasket, and a second Linda, who runs the Esther Bricques winery a little north of tonasket. Good ride today over Loup Loup pass, lots of climbing, but some fun downhills. It must be tough starting out in these mountains on a west to east trip. I saw a mountain lion today! As I was going down a small hill before starting to slog up the pass, I saw what I thought was a fox run onto the road. I wicket realized that it was farther away and lots bigger than I thought at first. I stared braking, and gave a loud YELL! I don't think it had noticed me before, because it swung it's head around pretty quickly, and then ran back the way it had come, slinking under the guard rail on the side of the road. Not something I was expecting to see. I practiced my yelling a few times in the next several miles. I can be really loud of I decided to, turns out. So that's my story of scaring away the Loup Loup Lion. Got to Winthrop a little after noon, I made good time. Got some groceries, had lunch and a beer at the old schoolhouse brewery (and got another sticker! ), the went to the library to catch up on email and plan next steps. I'm strongly considering taking the bus or train from Seattle to Portland instead if biking, since I wouldn't even be on the coast for that stretch, and there isn't a great route between the two cities. Meeting up with a friend this weekend to bike in the San Juan islands. Very excited about that. Just one more pass to conquer tomorrow, then I'll have an easy day to meet up with him in Anacortes the next day. 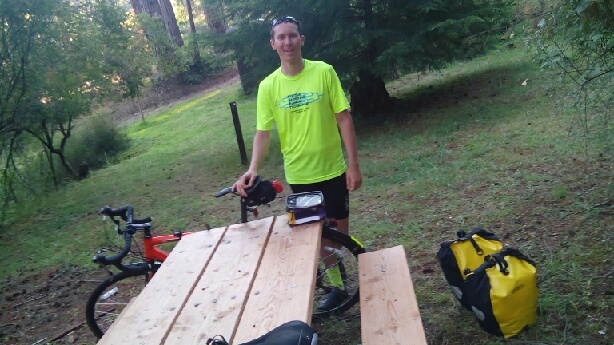 Staying between Winthrop and Mazama at the bicycle barn, a campsite set up by a family specifically for cyclists. Guess who I ran into when I arrived? Cadence! A welcome surprise, and great way to end the day.